This week, Jurassic World Evolution fans are dedicated to one simple mission: Flooding their virtual parks with stegosauruses. This isn’t because these fans randomly decided the world needed more big herbivores. There is a purpose to their sudden dinosaur obsession. 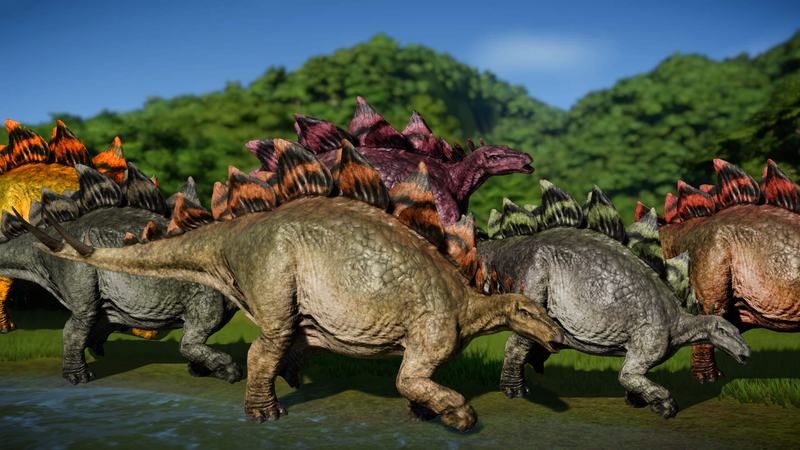 Evolution developer Frontier Development are celebrating their 25th anniversary and are tasking fans with creating and releasing a community total of 25,000 stegosauruses into their parks. Fans have only until January 31st to complete the challenge. While that number might sound high, Evolution fans have teamed up to produce all the stegos they can possibly create. On the Jurassic World Evolution subreddit, fans are sharing their creations and their stego collections. Some players are turning entire islands and parks into stego producing factories. Some skilled fans are able to produce up to 900 stegos on one island, which is a lot. Maybe too many dinos. Players are making so many stegosauruses they are causing their computers to crash. Many fans are also sharing memes and screenshots to help spread stegosaurus propaganda. The entire event seems to have successfully brought together the Jurassic World Evolution community. The entire subreddit is filled with stegosaurus related images, videos and posts. So what do fans get for all this stego breeding business? A new cosmetic gene for stegos that adds some purple to the big herbivores. Previously, only a few dinosaurs in the game had access to these cool purple genes. With some fans pumping out a few hundred stegos every day and players coordinating their efforts to create more, it seems like this challenge will be finished soon. Which is good. Who doesn’t want a purple stegosaurus?